Is the Future of Forest Offsets Already Here? Many environmentalists believe the carbon market has the potential to promote healthy forest management in the United States, and the Conservation Fund’s Chris Kelly argues it is happening right now under the California Climate Action Registry forest protocols. Others say the CCAR protocols will require significant changes to fulfill their promise. 22 August 2008 | Chris Kelly is spending his summer trying to catch the one that got away. In Kelly’s case, what got away was a forest — the 13,900 acre Gualala River Forest in southwestern Mendocino County in California. Back in February, 2004, Kelly almost purchased the Gualala – along with acreage to the north and south of it – on behalf of his employer, the non-profit Conservation Fund. He hoped to protect the prime forestland from being transformed into subdivisions and vineyards. He settled for the northern 24,000 acres, known as the Garcia River Forest, while the land owner held onto the Gualala River Forest in the middle, and a 19,000-acre tract to the south was sold to a vineyard. Now Kelly has a second chance at saving the Gualala and, in a strategy that would have seemed outlandish just a couple years ago, is depending on leveraging income from carbon credits to finance the purchase. Kelly can point to much more than the potential of carbon revenue. He has a track record of turning carbon talk into cash. California’s aggressive greenhouse gas commitment has been good for forest carbon credits. The California Air Resources Board (CARB) is the agency responsible for implementing the plans to reach California’s ambitious goal of returning to 1990 GHG levels by 2020. While CARB is busy developing the cap-and-trade system at the center of this effort, it has recommended a number of early actions businesses can take in the interim, including purchasing emission reductions from state forestry projects. 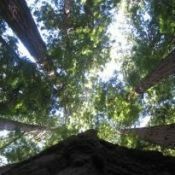 In late 2007, CARB endorsed the forestry protocols developed by the California Climate Action Registry (CCAR) to do it. This endorsement suggested that CCAR credits could be viable offsets under California’s cap-and-trade system and transformed CCAR forestry credits from a feel-good voluntary purchase into a solid pre-compliance bet in California – and beyond. Last month, the Western Climate Initiative released a Draft Design of the Regional Cap and Trade program and included forestry projects as one of three project types listed “as a priority for investigation and development to participate in the offset system.” Because of California’s role in WCI and its leadership in forestry, that investigation will surely follow the CCAR experience closely. Many observers believe CCAR’s reach could extend further. Indeed, drafts of a recently defunct US Federal Bill, the Boxer-Lieberman-Warner “Climate Security Act of 2008”, suggested that CCAR credits could, with approval of the US Federal Environmental Protection Agency (EPA), be viable offsets under a national cap-and-trade system. In February, CCAR listed Kelly’s forest conservation management effort in the Garcia River Forest as the second project in its registry, joining a similar effort in the Van Eck Forest by Pacific Forest Trust (PFT). Buyers promptly lined up to purchase Kelly’s newly minted Certified Reduction Tons (CRTs). They included Pacific Gas & Electric(PG&E), NatSource, 3Degrees, and Cantor CO2e. “There’s way more demand out there that we can satisfy,” he says, adding that he recently stopped marketing CRTs from the Garcia because he’s sold out through 2012. Kelly has more credits in the pipeline: he stewarded two other projects through the CCAR process on land that the Conservation Fund purchased back in 2006, and hopes to bring those CRTs (an estimated 80,000 a year) to market soon. But what really excites Kelly is the prospect of leveraging that pent-up carbon demand to help Conservation Fund purchase an entirely new piece of land: the Gualala River Forest. First, he’s looking for up-front commitments from buyers to purchase offsets from projects he’ll implement once the Conservation Fund assumes ownership of the land. Second, he’s taking those buyers’ commitments to lenders to borrow additional money to fund the forest purchase. With such promising deal structures and bountiful demand, one would assume the market would be flooded with new forest projects. But it isn’t. Six months after the Garcia and the Van Eck projects became listed at CCAR, they remain the only projects. While Kelly’s work may be exciting, its impact is unquestionably limited. The Conservation Fund’s current carbon activities effect roughly 50,000 acres of forest. That’s in a state with 16 million acres of forest, which is losing 30,000 acres each year due to poor management practices on federal lands alone, according to a recent study by the Forest Foundation. The Conservation Fund and PFT both argue that supply simply needs time to catch up to demand. “There have been market imbalances before,” says PFT co-founder and president Laurie Wayburn, adding that CCAR’s forest protocols are relatively new, and actors are still ramping up to deliver offsets to the marketplace. Like the Conservation Fund, PFT says it is actively developing additional forestry projects and expects to bring them to market within the next year. Much of that time is being used to explain the system. Landowners simply need more education about the potential impact of carbon finance on forest management. “People are getting up the learning curve,” says Robert Parkhurst, environmental policy manager for PG&E. In May, PG&E issued a Request for Proposals (RFP) for up to one million tons of CCAR carbon reductions to come from reforestation and methane projects. Parkhurst was pleased by the response. Lack of education may be a problem among many of the state’s smaller landowners, but larger landowners say they understand how the current CCAR protocol works; they just don’t like it. Sierra Pacific, for example, owns 1.6 million acres of California forest land, making it the state’s single biggest private owner. Spokesman Mark Severts says the company would like to develop carbon projects, but argues the current protocols simply prevent it. At issue is a requirement for projects to have a conservation easement, which is a binding commitment that places permanent restrictions on land. In the Gualala River Forest, for example, Kelly would like to receive a conservation easement that prohibits subdivision and agriculture conversion. But Severts argues that the conservation easement is a blunt instrument for landowners with large working forests where flexibility of land use is a key asset. “Almost no landowner is going to do that,” he says. Sierra Pacific has another beef with the conservation easement: it isn’t a good way to deliver the permanence requirement necessary for the carbon markets. Guaranteeing a reduction of emissions and making blanket promises about land use are not the same thing, Severts points out. A landowner can promise not to develop land via a conservation easement, and then a fire can come through and wipe out the carbon stocks anyway. The Conservation Fund and PFT dealt with that problem in their landmark deals by agreeing to leave a portion of credits from their early projects unsold, so they they could be used to cover such contingencies. But that kind of effort isn’t required by the CCAR protocols as currently written. Sierra Pacific and other industrial forest landowners shared their concerns with CARB, which asked a working group to make revisions after it approved the current protocols. That means tackling not only the conservation easement question, but also other thorny issues like refining definitions for baseline and leakage as well as folding public lands into the mix. The group features a wide variety of stakeholders and has been meeting for ten months now. They are due to make recommendations to CCAR in November with a proposal moving to CARB by February or March. The working group is looking closely at a method adopted by the Voluntary Carbon Standard (VCS) in which offset developers participate in an insurance pool that covers the projects in the case of non-delivery. Instead of using a blanket promise about land use like a conservation easement to guarantee credits, VCS asks developers to pay for the risk inherent in their plans. A successful revision of CCAR protocols may encourage more landowners to participate in the forest carbon economy, but it also may reveal an even more stubborn obstacle to large-scale participation: low prices. CCAR credits are trading in the neighborhood of $10 a metric ton these days. That’s in an economy where sending redwood to the timber mill pays roughly $30 a ton. In short, it’s still far more economical to harvest trees for timber than save them for carbon. Forest developers could bank their credits and speculate on a growing carbon market, but that would require adopting a different business model. That means the only groups with a true incentive to participate are those with charges to preserve forests – and not just make money off of them. In short, groups like the Conservation Fund and PFT. Carbon Finance – or Carbon Philanthropy? In his search to finance the Gulala River Forest, the Conservation Fund’s Kelly isn’t seeking out hedge funds speculating on the carbon market. He’s approaching foundations with environmental mandates which provide loans that most commercial lenders would not. If Kelly leverages his prospective forestry carbon credits to raise debt to buy the Gulala, it will be a significant advance for the carbon market. When he can take those credits to a lender motivated solely by profit, that will be another. Ted Rose consults companies and organizations on carbon offsets and renewable energy credits. He is based in Boulder, Colorado, and can be reached at ted@rosecarbon.com. Part Three: Are Regional Initiatives Ushering in the Forestry Age?